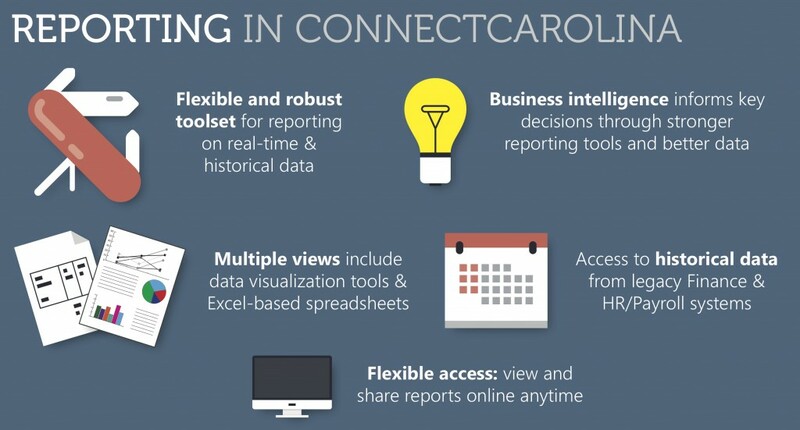 ConnectCarolina will enable tremendous reporting capabilities for UNC-Chapel Hill. While ConnectCarolina will provide all sorts of new capabilities upon go-live October 1, one capability is universally captivating campus administrators: reporting. For some, all the reporting that ConnectCarolina and a new data warehouse will enable is one of the biggest benefits—if not the biggest—of the enterprise report management system. After finance and human resources/payroll launch and join ConnectCarolina’s existing student administration system, ConnectCarolina users who have access permissions will have additional reporting at their fingertips. “The real payoff is that we’ll have all of this data now under one warehouse, enabling many people to do a lot more trending, analytical work with the data,” said Scott Jackson, Executive Director of ITS Enterprise Reporting and Departmental Systems. Through ConnectCarolina, ITS will give the various campus units and schools access to the data warehouse in a very secure, restricted way so they can do much of the trending and report development themselves. Matthew Brody, the University’s Associate Vice Chancellor for Human Resources, sees much potential with the new reporting capabilities. “I see a whole lot of bells and whistles in the reporting arena,” he said. Human Resources will be able to leverage the analytics capabilities by proactively mining data to understand the University’s workforce as well as workforce trends. The division also will be able to use such information to inform its decisions on training investments. With ConnectCarolina and the data warehouse, Kevin Seitz, the University’s Associate Vice Chancellor for Finance, anticipates much easier reporting and better tracking. “We’ll be doing more of our own reporting now, including ad‑hoc reporting, special reporting, analysis for management, and things like that,” Seitz said. It will take time for campus units and schools to adjust to the possibilities of having access to all that current, integrated information, Jackson said. Now the only limitation will be people’s imagination for all the ways they can use the data. This trend of data discovery, Jackson said, will change at a rapid pace, creating vast opportunities for innovation.